Various covers of the HMAS Creswell Magazine and Royal Australian Naval College Magazine. Following the institution of the Royal Australian Naval College in 1913, an annual magazine has been produced to capture the activities of both the college and those under training in it. Initially entitled the Royal Australian Naval College Magazine, this collection has been digitised and placed in the public domain as part of the Sea Power Centre - Australia's ongoing digitisation project. The aim of this project is to make historic records and information more readily available to members of the public. 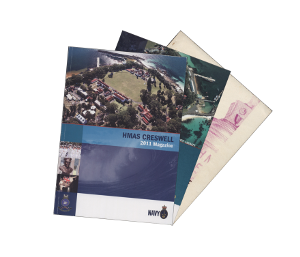 The inclusion of, what is now known as, the HMAS Creswell Magazine series is viewed as an important addition to the RAN's historical record.